based on an amalgamation of the four Gospels and the visions of Mary of Agreda and Anne Catherine Emmerich whose revelations appear in the book "The Dolorous Passion of Our Lord Jesus Christ"
Jesus of Nazareth lived a secluded life in the town of Galilee (Nazareth) until he was thirty years of age. He had taken up his father's trade of carpentry [Matthew 13:55]. The duration of his public life has been debated, but is believed to have been under three years, during which time he performed numerous miracles while on his journeys. The Jewish High Priests grew uncomfortable when Jesus proclaimed that he was the Messiah. Led by Caiphas, they had Jesus arrested and urged Pilate for his crucifixion. Mary, Mother of Jesus The early years of Mary's life are uncertain. Some apocryphal writings indicate that she stayed at the Temple of Jerusalem, while the Church believes that she resided at home with her parents. Regardless, at a young age Mary made a vow of virginity. Jewish custom implies that the parents of Joseph arranged his marriage to Mary. She agreed because it was God's inspiration for her. She conceived a son, Jesus, through the divine intervention of the Holy Ghost (to protect her virginity). Mary Magdalene In the Bible, Jesus cast seven demons from her [Luke 8:2.16]. She is thought to have been present at the Passion (suffering). 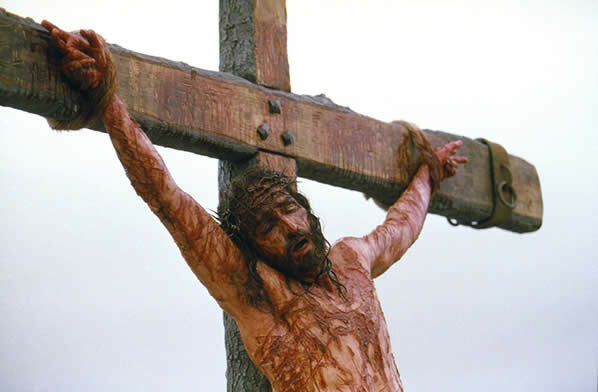 The Bible also places her at the Crucifixion [John 19:25] and at Jesus' Resurrection [John 20:18]. Saint Mary Magdalene is thought by some to have been an adulteress. This may be because two women anointed Jesus' feet in the Bible, one likely was an adulteress and the other was Mary of Bethany. It is not certain that Mary of Bethany was indeed Mary Magdalene. Pontius Pilate The fifth Roman procurator to rule Judea, the part of Palestine adjacent to Jerusalem. Pilate ruled from A.D. 26-36, and is infamous for his decision to crucify Jesus in A.D. 33. Most procurators under the Roman Empire at that time did not have supreme judicial power like Pilate. Instead, they acted primarily as financial administrators. The Jews saw Pilate as a severe and merciless ruler, even though writings in the canonical Gospels stress his efforts to acquit Jesus. Joseph Caiphas was appointed High-Priest of the Jews around A.D. 18 by Pontius Pilate's predecessor Valerius Gratus. Although he believed in the coming of a savior [John 11:51-52], Caiphas is known for his discreditable part in the death of Jesus, employing desperate means to rouse his followers. 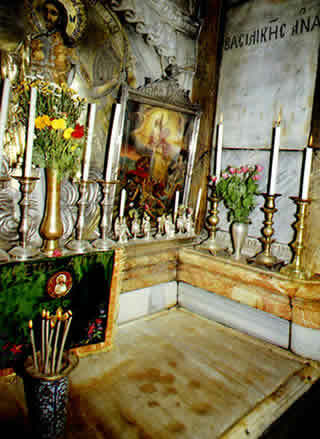 The meeting that resulted in the decision to apprehend Jesus was held at the house of Caiphas. By tradition it is said to have stood on the hill south of Jerusalem, known as the "Hill of Evil Counsel." "I pray for the people who are upset. I sincerely believe that their suspicions are wrong. This movie will bring people closer together, not incite violence and hatred. That was our experience in making it, and that has been the experience of the people who have seen it so far." Before being asked to play Jesus, did actor Jim Caviezel really think that he was meeting for a surfing movie? Was the actor who played Satan a man or a woman? Where was The Passion of the Christ filmed? The Passion of the Christ was filmed on various locations in Italy, including Rome's Cinecittà studios. The movie's director, Mel Gibson, had visited several other locations prior to filming, which had been previously used for similar films. In the end Gibson wanted to find locations that had been relatively unexplored through the lens of a movie camera. He found these ideal areas in Italy, including the towns of Rome, Lazio, Craco, Matera, and Basilicata. If you watch the film's credits, you will notice an abundance of Italian names, including Monica Bellucci (The Matrix Reloaded, 2003), the popular Italian actress who portrayed Mary Magdalene in the film. Did the actor Jim Caviezel really get struck by lightning when shooting the Sermon on the Mount? Yes. According to Caviezel, who portrayed Jesus in the film, this really happened. In the Newsweek interview, Jim Caviezel said the following about the bolt from above, "We were shooting the Sermon on the Mount. About four seconds before it happened it was quiet, and then it was like someone slapped my ears. I had seven or eight seconds of, like, a pink, fuzzy color, and people started screaming. They said I had fire on the left side of my head and light around my body. All I can tell you is that I looked like I went to Don King's hairstylist." Caviezel then implied that the strike might have been God's way of telling him that he (God) was unhappy with the take. When you think about it, God and directors are not all that dissimilar. What motivated Mel Gibson to make a movie about Jesus' final hours? In an interview that appeared in the February 2004 issue of the Knights of Columbus magazine Columbia, Mel Gibson said the following about deciding to make the film, "About 13 years ago I came to a difficult point in my life, and meditating on Christ's sufferings, on his passion, got me through it. ... And when I did that, through reading, and studying, and meditating and praying, I began to see in my own mind what he really went through. ... The story, the way I envisioned the suffering of Christ, got inside me and started to grow, and it reached a point where I just had to tell it, to get it out." Did the Vatican, fearing the controversy, really change its position on the film? Was The Passion of the Christ really advertised on a NASCAR racecar? Bobby Labonte, the 2000 NASCAR champion, displayed a paint scheme featuring the film on the hood of his Chevrolet (right, click to enlarge) for the 2004 Daytona 500. 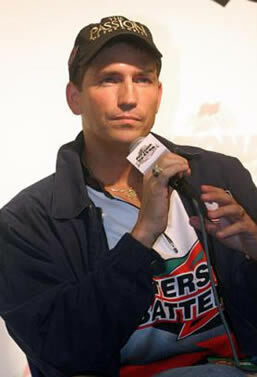 Jim Caviezel attended the race to cheer on the controversial No. 18 Interstate Batteries car. Caviezel, who was in the car's pit on race day, is no stranger to racing. He drove the 50th Anniversary Chevrolet Corvette Pace Car at the start of the 2002 Indianapolis 500. What did director Mel Gibson use as the basis for his interpretation of the story of Jesus? Does director Mel Gibson appear in The Passion of the Christ? 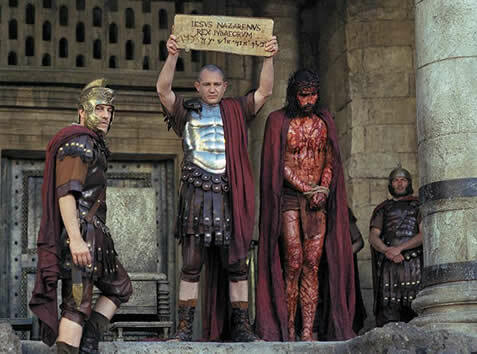 Was Pontius Pilate really as morally conscious as he was portrayed to be in the film? Did Judas really hang himself? The New Testament contradicts itself regarding this occurrence. According to the Gospel of Matthew, "So Judas threw the money into the temple and left. Then he went away and hanged himself." [Matthew 27:5] This indicates that he returned the money to the temple and then committed suicide. However, according to Luke in Acts 1:18, "With the reward he got for his wickedness, Judas bought a field; there he fell headlong, his body burst open and all his intestines spilled out." This implies a more guiltless Judas. Mel Gibson, using an amalgamation of the books from the Bible, obviously chose the version from Matthew. 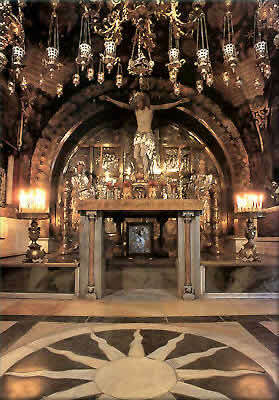 Did Jesus really carry the entire cross to Golgotha? Why did Mel Gibson define Simon of Sirene heroically when the Bible only depicts him as protesting against helping Jesus carry the cross? In the interview with Bill O'Reilly, Mel Gibson said the following about his depiction of Simon, "He's in the Book as protesting. He (Simon) didn't want to do it. He's saying, 'Hey, remember, I'm not the criminal here. He (Jesus) is. I'm just helping him.' And it's like the journey that we all have about choices we have to make. I wanted to take that opportunity to take this man, and have him have a burden put on him that he didn't necessarily want but that he ended up taking and that he ended up engaging with and that he ended up learning from and that he transcended any kind of self-concern and became a true hero. I think people have the capacity for that." What do the Latin letters "INRI" on the top of the cross mean? How did Jesus die, and how much pain did he feel? Medical examiner Dr. Frederick Zugibe examined Jesus' death for the Trinity Pictures video "How Jesus Died: The Final 18 Hours." First, as Dr. Zugibe stated, the position of the body on the cross was designed to make breathing very difficult, and as an individual's time on the cross wore on, which could last several days, one could eventually die from suffocation. 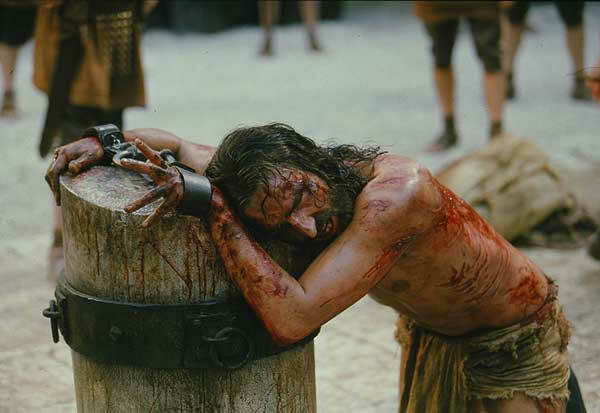 Jesus' wounds from his torture (the film) however were much too severe to indicate that he lasted that long. The nailing of the hands would most likely pierce the median nerve. As Dr. Zugibe stated for the video, this would cause a "severe, excruciating, burning pain, like lightning bolts traversing the arm into the spinal cord." Rupturing the foot's plantar nerve with a nail would cause a similarly horrible pain. In the end, Dr. Zugibe believes that Jesus died from shock due to loss of blood and fluid, as well as traumatic shock from his injuries, plus cardiogenic shock, which caused his heart to fail. I heard that the spikes were hammered through Jesus' wrists and not his hands, is this true? Was the cross that Jesus was crucified on shaped like the letter T instead of the Christian cross symbol ()? When Jesus was on the cross was he really pierced with a soldier's spear, causing the sudden release of a large amount of blood and fluids? Watch Jim Caviezel discuss the hardships he endured while making the movie. 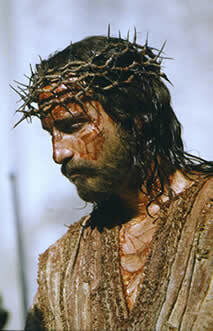 Jim Caviezel Interview: Passion of The Christ. 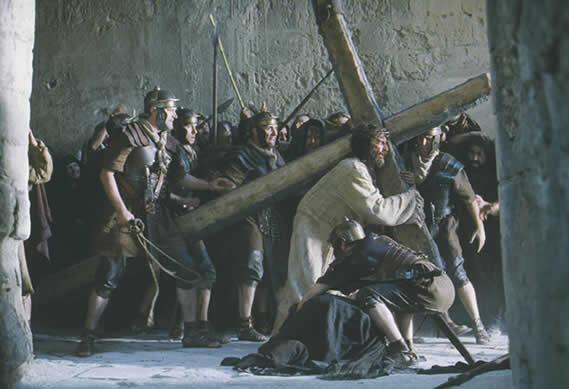 The actor talks about the suffering he endured during the grueling filming of the movie, including suffering symptoms of hypothermia while up on the cross. He also offers his own reflections on the film's hard to watch lashing scene.